Hatters boss Nathan Jones praised his side’s ‘relentless’ display during their 1-0 win at Wycombe Wanderers yesterday. Town had been second best for large periods of the first period, but around the half hour mark, finally got into the game, and immediately went ahead through Cameron McGeehan’s stunning strike. The visitors then dominated after the break, coming close to adding to their lead on a number of occasions, as Jones said: “First half, we were nowhere near like we were Tuesday, in terms of fluency, in terms of the way we played, but that’s a credit to Wycombe. “They came out of the blocks, they were sharp, they were on it and we were lucky not to be one or two down if I’m honest. We didn’t start well enough for a side that I asked for a word from today, I asked for them to be relentless and we weren’t. “We’ve got to be better than that on the second ball, we had an extra man in midfield and they dominated in midfield, so that wasn’t acceptable. “But I’m so, so proud of them for the second half performance, I thought they were absolutely outstanding. To come away from home, that type of performance, it’ll do for me. “That’s a team I can be proud of and can put out there. They were excellent, they gave me what I asked for, I asked them to be relentless and they were second half. On just what changed from the opening half hour where Wycombe looked to be in total control, Jones continued: “At times you have to be brave, I have a way of playing, sides think they can work you out, but you have to be brave. “I thought we showed a lot of bravery, in that second part of the first half and we came through. Jones was also thrilled with his side for never once sitting back on their lead during the second period, which was a definite criticism of the Town during the first half of the season. 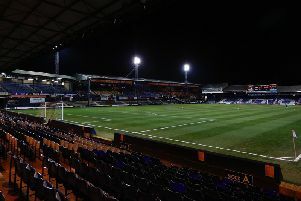 This time, it was they who looked most likely to score, with McGeehan, Jack Marriott, Paul Benson and Craig Mackail-Smith coming close to increasing the visitors’ lead as he added: “We won’t be a team that sits back and defends and tries to cling on. I want a brave team, I want to win football matches, I don’t just want to cling on to stuff, that’s not me as a person, not me as a manager and definitely not me as a coach.